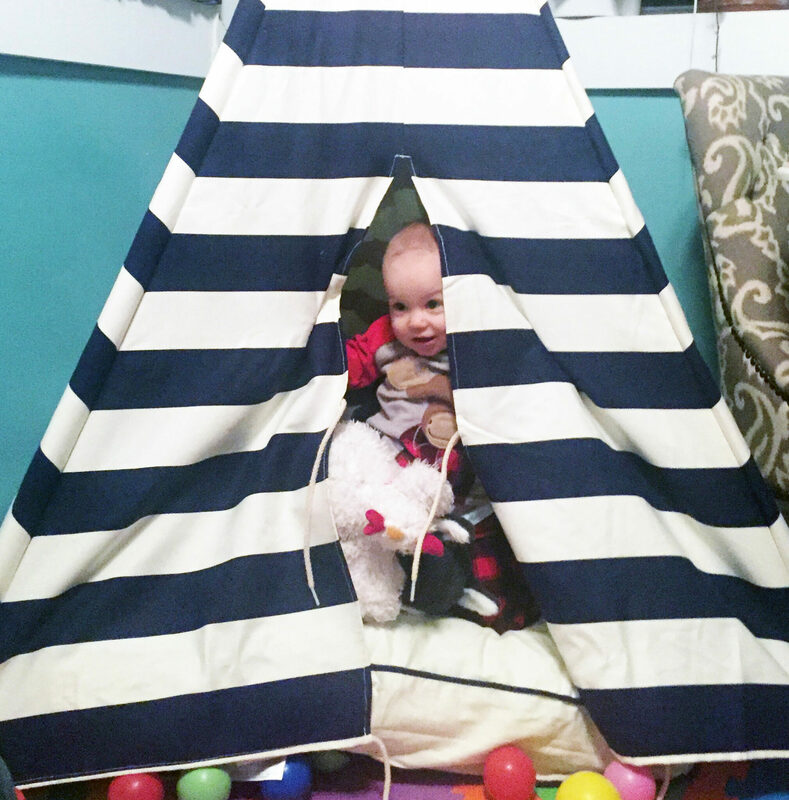 A little over a year ago we handed over another room of our tiny 1400 square foot house to our little boy and it all started with a teepee. 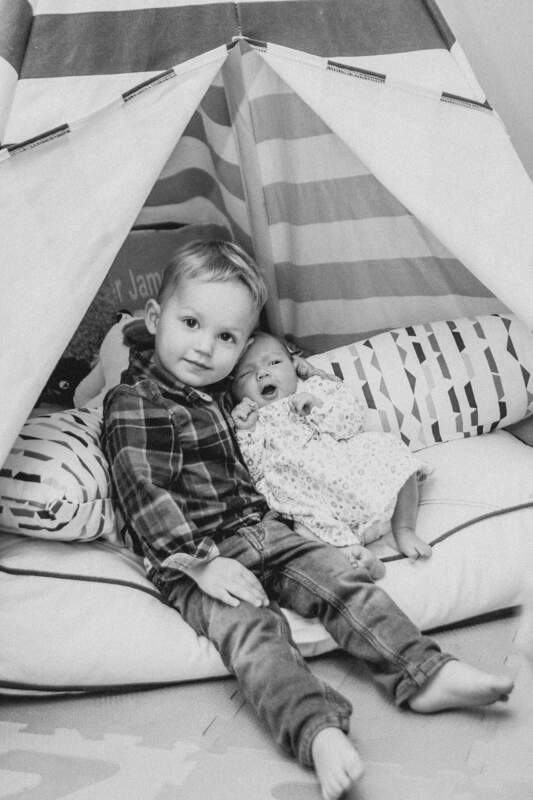 While deciding what to get Cooper for his first real Christmas (the previous year he was a tiny 6 weeks old) I discovered the most adorable (and on sale) teepee from Crate and Barrel’s The Land of Nod. I had to have it. When the teepee arrived it came in multiple, very large boxes, and it occurred to me that we didn’t have a single spot to put the very adorable teepee. 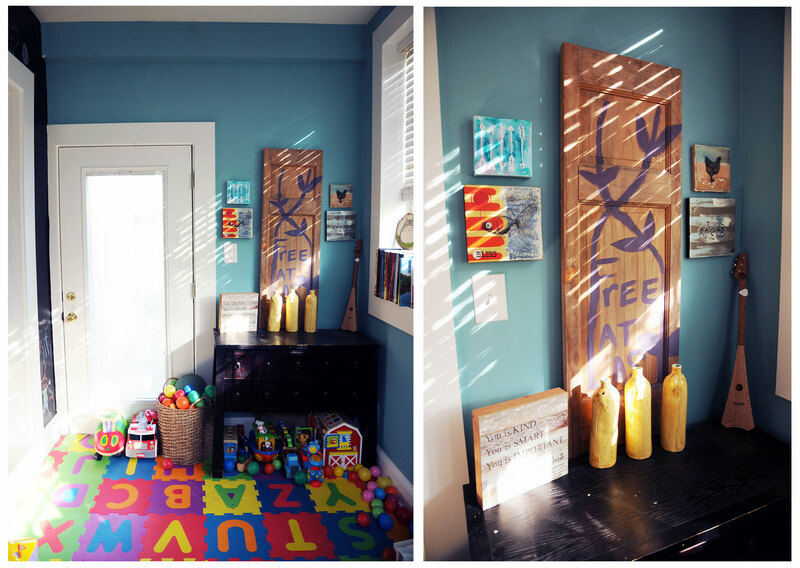 Cooper’s room was already at the brink of full with his crib, changing table, and glider. 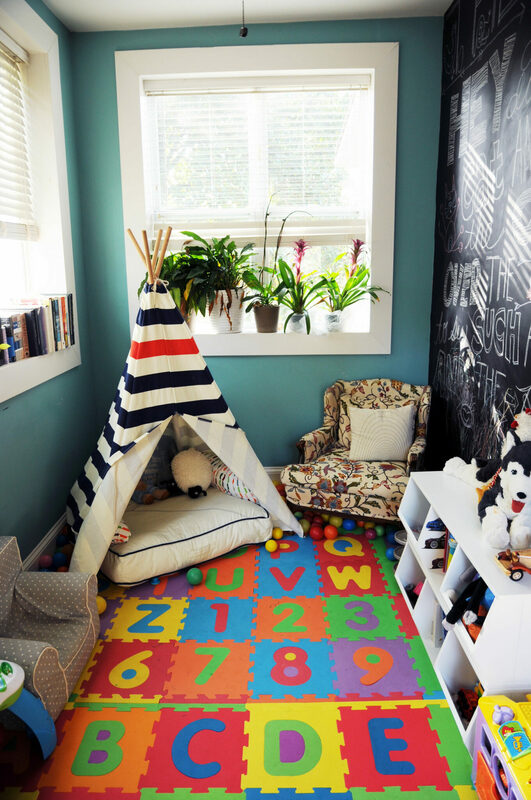 Our front bedroom was still functioning as a guest bedroom, and a teepee didn’t quite fit the decor. As I looked around, brainstorming ideas for where this was going to go, I really began noticing the overflowing basket of toys in our living room. I realized this was just the beginning. Cooper had only just learned how to walk, and already our house was overrun with his stuff. It was just going to get worse. I told Nick that I was going to try rearranging things and he was just going to have to trust me. I promised we would put everything back if it didn’t work. But really, what we both knew was my mind was made up. We were saying goodbye to our rarely used (but nice to have around) dining room. Our house was built in the 1940’s with a screened in porch on the side. We aren’t sure when, but at some point before we purchased the house the porch was converted into an interior space. It still has the feel of a former porch, it’s long and narrow. You have to step down through the doorway to access it, and the windows are big and beautiful, letting in amazing natural light. It isn’t very poorly insulated. As Nick likes to put it, in winter you can feel the heat leaving your body if you are sitting next to the doorway to the room. The only time the room was used was when I was making art and we were entertaining guests. I couldn’t justify the space we use most, our living room, continuing to fill up with Cooper things when we had this space that could be better utilized. 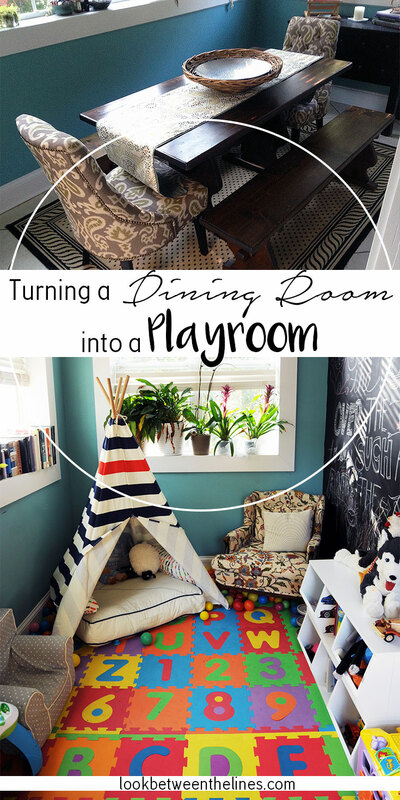 I started by moving the cloth covered chairs pictured above and the adorable white, round table that I loved in our kitchen (read about it in a visual journal post here) to our attic. I mourned the loss of those pieces of furniture for a moment before moving onto my next task, telling myself one day in a bigger house they would once again see the light of day. 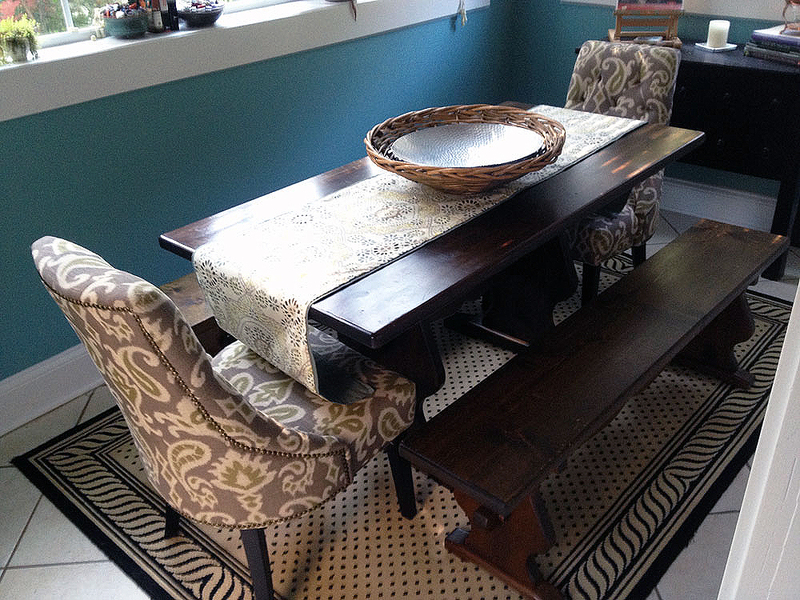 I moved the farm table and benches to our kitchen and paired them with the blue chairs that were already in there. The table ate up the small nook in our kitchen, but I ended up painting them white to help it feel less full. Next, I added the cushy, letter and number floor mat to cover the hard tile. I cut them to make sure every inch of the tile was covered. When Nick saw me cutting up the mats I had just bought to “test whether or not this would work” I think he realized it was a done deal whether he liked it or not. The floor mats have served two useful purposes in that room. They help Cooper from getting less injured when he falls and it helps insulate the floor. I already loved the turquoise color in the room, so I opted not to repaint the entire room. 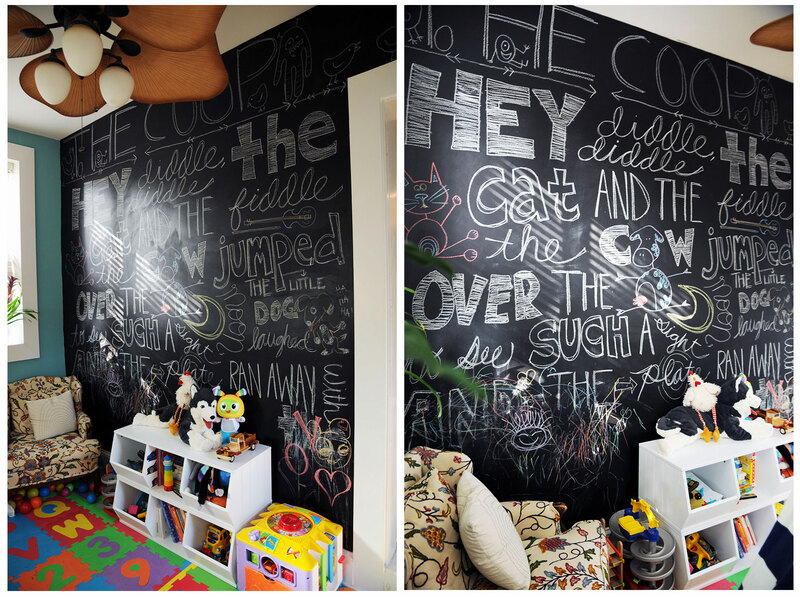 Instead, I added a full chalkboard wall to one wall. Cooper loves scribbling on it, and I loved adding the “Cow Jumped Over the Moon” poem to it. We even have a space where we mark Cooper’s height. Kennedy will be up on the board before long! 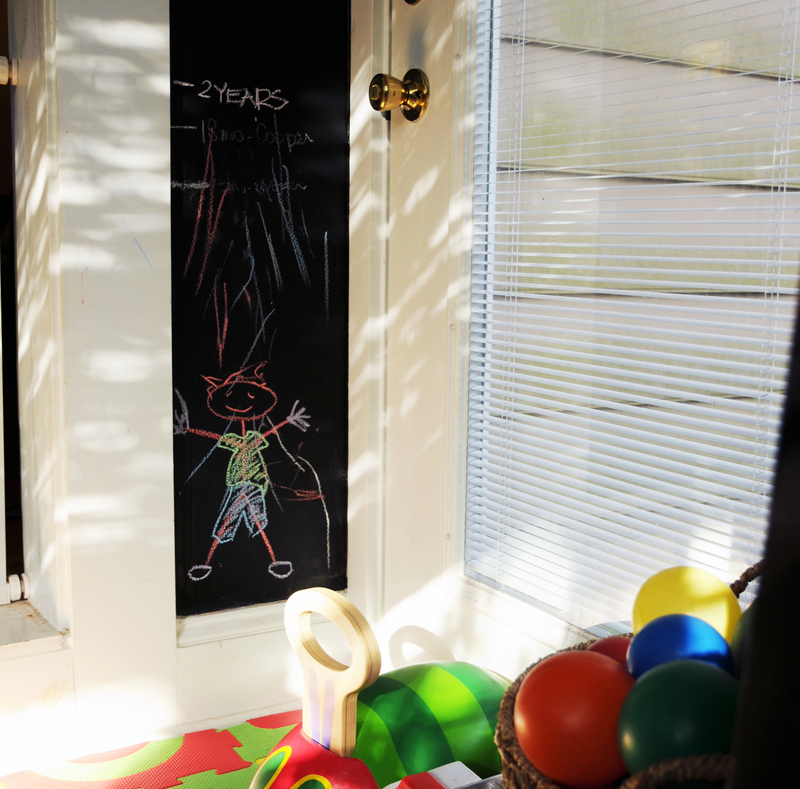 I also mark it on the door molding with a sharpie for a more permanent record than chalk. After floor covering and painting, all that was missing was Cooper’s stuff. I didn’t realize how much stuff he actually had until it immediately filled up the room. We added a shelf for books and toys, as well as various baskets. His teepee looked amazing in the corner. I still haven’t figured out how to keep the room looking neat with all the scooters, bikes, and toys lining the walls, but if I am being honest with myself a playroom really shouldn’t ever look clean. I kept a shutter that Nick found on the side of the road propped up against the wall. Someone painted “free at last” in purple on it. I love it. I have thought about adding to it, but haven’t taken the plunge yet. I love that this is exactly the way we found it, and I can’t decide if I want to touch it. I imagine the original artist painting the vines and text, only someone in good spirits would paint “free at last.” It adds good vibes to the room. Around the shutter I added some artwork that I have traded for at festivals over the years. One of my favorites is a piece by Lovely Bones Illustrations (follow her on Facebook here and Instagram here), a little creature painted on a cut piece of wood. Cooper’s teepee fits perfectly in the corner and is always full of pillows, stuffed animals, and a Cooper from time to time. 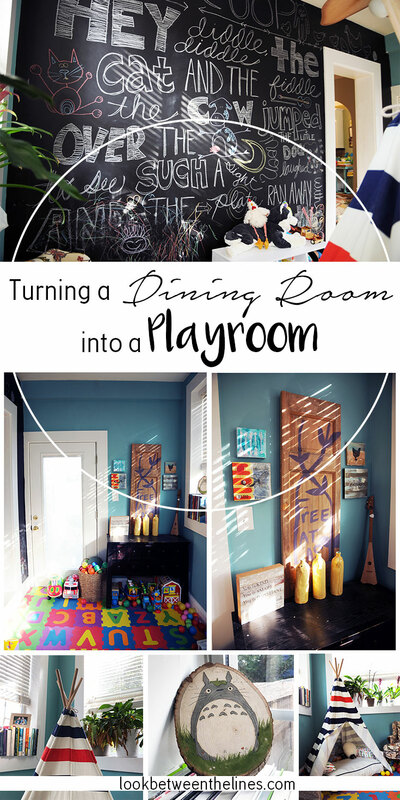 While I wish we still had a more comfortable place to sit and break bread with friends, I would never go back on covnerting the playroom. Having a space where Cooper can play freely is invaluable. It also helps to have a room where I can toss his stuff without thinking twice about the way it looks. Thanks for taking the time to check out my blog! 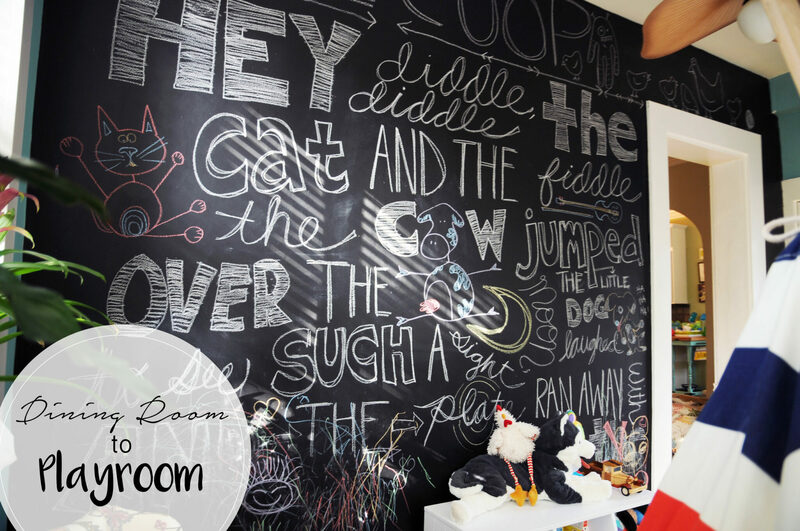 Check out my other chalkboard paint project here. Want to read more? Get these posts delivered right to your inbox by subscribing in the form below. Thanks for stopping by!